The province go into today’s clash full of confidence but also fully aware that there needs to be a big improvement this season. Cullen's men are expected to get their campaign off to a winning start. THE EXCITEMENT AROUND Leinster HQ has been building all week, but so too has the level of apprehension as the return of European competition has inched closer. Five Guinness Pro12 wins out of six, including an interpro defeat of Munster last weekend, has left the province in good stead heading into today’s clash with Castres at the RDS [3.15pm, BT Sport 1] but the Champions Cup provides a different proposition entirely. The mood around the province is positive and there are certainly signs of progression this term yet niggling away at the back of the mind are the deficiencies which undermined their campaign last term. Cullen is a year wiser as a coach and certainly the harsh lessons he learned last year on the continent has battle-hardened him for the challenges which lie ahead — now he must place faith in his players to deliver on this stage. The flashbacks of that harrowing November Sunday will have played over in Cullen’s head this week, as Wasps delivered Leinster’s worst nightmare and inflicted a record home European defeat. It set the tone for a wretched campaign which saw the province win just one game and their reputation as one of Europe’s heavyweights fade in Cullen’s first season in charge; he and the players know the stakes have been raised. “It’s very important, we’re at home in a big European fixture,” the head coach said looking ahead to the visit of Castres. “We got ourselves in trouble because we had a poor start in the campaign and it’s just hard to get yourself back on track after that. “It’s important that we give a good account of ourselves. We’re putting blocks in place that we can try and build week to week and we’re seeing signs of progress every week which has been pleasing. 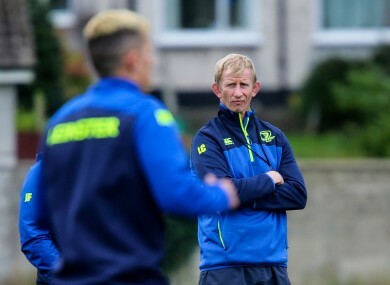 Although Leinster sit second in the Pro12 table after the first block of games, and there have been plenty of positives to take, it’s hard to know exactly how that form will manifest itself on the European stage. Coaches and players always speak of the added intensity which comes in the Champions Cup and it’s certainly been a buzz word around the province’s UCD headquarters over the last fortnight. Everyone knows what’s coming, it’s just a case of whether the hosts will be fully-equipped to bridge the gap between Pro12 and Champions Cup rugby later this afternoon. “It’s hard to know if the Pro12 has been preparing us,” Cullen admits. “We’ve had some really tough games over the last few weeks. The intensity of last week then, Munster at the Aviva, those games are always really testing. If there is one game you would want before round one of Europe, they don’t come much better than that. “The pools are tighter and tighter and with four less teams the quality has been condensed. Teams all around Europe are gearing up more and more each year. It’s a tough challenge. “We’ve had a decent run of form ourselves and we go into the game with confidence but it’s another step up. Everything the players have been doing up until now has been gearing towards these two European games. The work that we do training wise is making sure we’re making progression as a team. Preparation time has been far greater but so too are the resources available to Cullen this time around. The World Cup hangover of 12 months ago left him devoid of some of his most important players at the most defining stage of the campaign. While Johnny Sexton and Sean O’Brien are absent today, with Joey Carbery deputising for the former, Cullen has been largely able to call upon his big guns since the start of the season. Rob Kearney is one of 10 internationals included in the XV for today and lines-up at fullback for his 180th cap for the province. He’s one of the senior members of the squad who know exactly the level Leinster need to reach to compete with Europe’s elite again. “I think we still have a fair bit to go,” Kearney offers honestly. “I think defensively we’ve made some really big strides over the last four or five weeks. “I think our attack game has still a fair bit of growth in it. It’s just trying to improve on them week on week. Saturday is another day where we need improvement and probably a little bit more than we’ve seen over the last four or five weeks. “I think there’s a huge amount of excitement this year. The atmosphere around the club is really strong and I think that’s something that can never be underestimated. That’s the end goal, the first hurdle coming in the form of a powerful and dangerous Castres outfit today. If nothing else, Leinster are fully focused on clearing it this time around. Email “'It’s hard to know if the Pro12 has been preparing us' - Leinster turn to Europe”. Feedback on “'It’s hard to know if the Pro12 has been preparing us' - Leinster turn to Europe”.